Common Loon on a Maine lake. Do you know what a puffin is? It’s the clown of the bird world. Rather than a big bulging red nose, it has a boldly colored red beak. Instead of white greasepaint slathered on skin, a mask of white and black feathers gives the same comical effect. The large red webbed feet are every bit as funny as a pair of oversized clown shoes. Even though these delightfully roundish shorebirds get most of the press, Maine is home to hundreds of other bird species. They make their homes on quiet lakes, in woodland forests and in the remote wilderness along the Appalachian Trail. Your chances of finding a particular bird depends on what part of Maine you are visiting. A good birding map also helps. While many species, particularly some of the waterbirds and raptors, are found throughout the state, some birds require a more specific habitat. The Northern Three-Toed Woodpecker prefers the forests of Aroostook County, bordering Canada. Spruce Grouse thrive in the sparsely populated Maine Highlands and throughout Baxter State Park. Their cousins, the Ruffled Grouse, live in the foothills near the eastern edge of the White Mountains. The latter bird displays a mottled plumage to better match the hardwood forests found in this area. The Kennebec and Moose River Valley Region is filled with boreal forests and countless lakes. 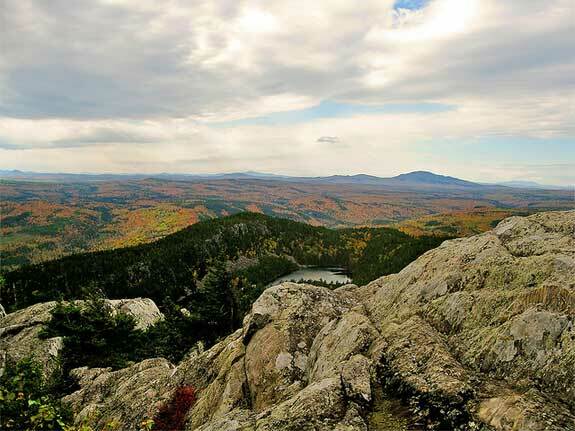 The area is known for its songbirds including the Black-capped Chickadee, Maine’s state bird. 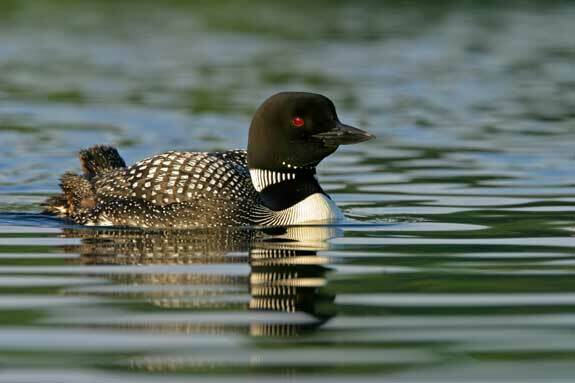 The Common Loon frequents the lakes. This three-foot tall bird is the only one of its species to breed in Maine. These are cross-border travelers and are found throughout most of Canada. The Canadian one-dollar coin is even called “the loonie” because of the loon engraved on one side. The entire Maine coast is home to resident and migratory seabirds. Least Terns and Piping Plovers have nesting colonies on ocean beaches in the south. On the Midcoast the Kennebec and Andoscoggin Rivers and countless ponds are filled with wild rice, providing rest stops for migrating geese and ducks. Sitting out in Muscongus Bay is Wreck Island, hosting one of the largest Great Blue Heron nesting colonies in Maine. Bald eagles are a common site on this part of the coast. If you prefer not to venture out into the wilderness, visiting one of the Maine Audubon Bird Sanctuaries will still give you plenty of chances for bird photo ops. Gilsland Farm, in Falmouth just north of Portland, offers over two miles of easy-going pathways leading past salt marshes, orchards, meadows, forested areas and ponds. The area is a stopover spot for migrating Canada geese and year round home to finches, thrushes, eagles and red-tailed hawks. Rent a pair of snowshoes and take to the trails during the winter. Farther inland in the town of Holden is the Fields Pond Audubon Center. The 192-acre site and its 85-acre pond are open year-round. Ducks, geese and songbirds are frequent visitors. In winter the trails are used for snowshoeing and cross-country skiing. On Maine’s south coast, the Rachael Carson National Wildlife Refuge includes a number of bird habitats. The Common Loon arrives at the tidal creeks and stays until spring. Several varieties of sandpipers practice their stilted walk along the mudflats. Gulls are year round residents. Though they usually stick to the tidal flats, gulls sometimes head for the creeks to see if the diving ducks have caught anything worth stealing. More than 120 land bird species have been found within the refuge, including several raptors. The refuge is made up of a number of smaller bits of land, most of them near Wells. Additional sections of the refuge are found in Kittery, York, Kennebunk, Saco and Scarborough. This is a wilderness area and large mammals, including moose and deer are free to roam wherever they please. Hunting and fishing in season is allowed. Hiking a trail and capturing wildlife with your camera is encouraged year round. Each May the town of Bar Harbor hosts the Acadia Birding Festival. Guided birding walks to Mount Desert Island take visitors to what the local birders call the “hot spots.” Some 180 species of both land and water birds call the island home. In the open grasslands you may see the Bobolink or the Nelson’s Sharp-tailed Sparrow, both of which breed on the island. The American Bittern and Common Snipe are found along the marshy shores. Black-backed Woodpeckers and Boreal Chickadees are found in the island’s forest. The festival teams up with whale watching cruises that include visits to the Atlantic Puffin and Arctic Tern breeding sites on Petit Manan Island. Another option is to take a kayak or canoe trip with a Registered Maine Guide into the local bays and marine estuaries to find sea and land bird species. Bring your binoculars and your camera and enjoy the experience. Audubon's most remote sanctuary, Borestone Mountain, in the 100-Mile Wilderness Region.